Here is how the Coalition of Community Schools defines their concept of community schools. Personalized learning has come to mean learning through digital devices. Community schools sounds enticing. Everyone is supposed to be involved with helping children succeed. What could be wrong with neighborhoods demonstrating compassion for their children? We all should have a vested interest in America’s future. But is that what’s really going on, or are today’s community schools another way to transform public education to school choice? Will community schools privatize public education, end the teaching profession, and hand education over to technology? Will community schools be the final blow to public education? Before signing on to the community schools concept, it is important to ask some serious questions. The six concerns involve partnerships, the diminishing teacher’s role, the lack of clarity, replacing brick-and-mortar schools with more data and tech, social impact bonds, and the destruction of school boards. With community schools, we see a shift in responsibility for the school from parents and teachers to business stakeholders. While community involvement in schools is important, and it should be about bolstering the lives of children in the school system, it’s wrong for businesses to dictate how schools should run. Consider the Luminary Learning Network involved with Denver Public Schools. This is a 501 (c) (3) that partners with The Gates Family Foundation. They claim it’s an Innovation School Zone run by the community schools partners and with Empower Schools—a strange pro-privatization group out of Massachusetts that claims to inform and shape policies and share learnings to help advance the Third Way. All of this breaks up the structure of the school and it looks as if it will pave the way for personalized learning—students who learn anywhere, anytime on the computer. In a recent Phi Delta Kappan article called “Moving from Survival to Fulfillment: A Planning Framework for Community Schools,” there are worrisome signs that the new community schools movement is hostile to teachers and public schools. 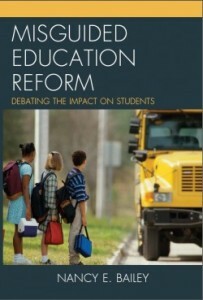 The article speaks well concerning the need for wrap-around services, but they also say: community school staff must be willing to relinquish some control and play a supportive role for students, parents, and community members as they [community members] become leaders, strengthen their voices, and perhaps even disagree with and demand changes in the school and other service providers. Teachers, staff, and site coordinators may find it difficult to take a back seat in this way. This article goes on to say that the community must be motivated and empowered to stand up, criticize the status quo, define the changes they want, and act. They still talk about closing public schools. This is anti-teacher school reform talk that sounds suspiciously like Parent Trigger, laws that permit parents to convert their public schools to charter schools. The law was written by a group called Parent Revolution. Parent Trigger was funded by billionaires, including the Walton Family Foundation, the Bill and Melinda Gates Foundation, and the Eli and Edythe Broad Foundation. Business has been behind many of the insidious high-stakes testing reforms that have gripped our public schools in the past. They’ve been behind the closure of many public schools, and the destruction of the teaching profession. These same groups now support community schools through partnerships that will run with little consistency, or with few rules. What’s described often sounds like school choice. For example, wealthy parents might start an art school in a wealthy area of town, while poor students in the inner city may have a no excuses charter school run online. Without rules, anything goes. The PBS documentary “The Uncomfortable Reality of Community Schools” questioned the role of such schools when it comes to segregation. The Chamber of Commerce is on board for community schools. Ask when the Chamber of Commerce has been a friend to teachers and public education. They have always supported Teach for America. Moreover, with the recent passage of the federal Every Student Succeeds Act, states cities, and towns have an important new opportunity to rethink how they want schools to function. In particular, do they want them to continue to be stand-alone institutions that meet only a portion of students’ needs? Or are they ready to build more dynamic and supportive partnerships among schools, families, and other local stakeholders. Tech groups like iNacol and Knowledgeworks are interjecting competency-based education into school districts across the country in the name of community schools. Digital Promise calls them the League of Innovative Schools. Here’s a list of schools that have signed on. Their agenda is to end public schooling and place students online where they are measured nonstop without professional teachers. These groups are all about collecting data on children. There are signs to indicate what is meant by “redefining” schools. We hear about improvements like afterschool programs, mobile libraries, tutoring, business internships, social-emotional learning, summer programs, and outside art and music experiences. There’s little emphasis on increasing funding to schools, improving curriculum offerings, lowering class sizes, or improving special education services. Will community schools cash in on social impact bonds or Pay for Success schemes? These are contracts where businesses finance public social programs, getting a return on their investment if the program succeeds. These financial arrangements shift reliance on funding from the taxpayer to business. Corporate influence on schools becomes paramount. I counted eight articles about community schools in the PDK issue. They culminate with articles about data collection and also an article that questions the role of the school board. They state it’s time to entertain some new and dramatically different ideas about how to structure the boards that control school systems. The school board involves our representation, or ownership, of our schools. It’s what makes public schools democratic. Good community schools would not destroy the school board. They would celebrate it! If you live in a school district which is talking about community schools and redesigning public education to reflect such an arrangement, ask the serious questions that need to be asked. Ask how much money is going to technology. 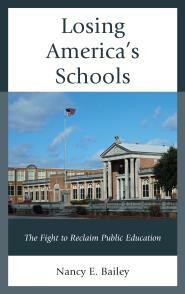 Question how many charter schools will replace traditional public schools. You may be signing off on the choice plans of Betsy DeVos. Community schools might not be about community but about choice. Wendy E. Shaia and Nadine Finigan-Carr. Moving from Survival to Fulfillment: A Planning Framework for Community Schools. Phi Delta Kappan. 99 (5): 15-18. Reuben Jacobson, Lisa Villarreal, José Muñoz, and Robert Mahaffey. “It Takes a Community.” Phi Delta Kappan. 99 (5): 8-14. Joshua P. Starr. “Let’s Be Honest About Local School Governance.” Phi Delta Kappan. 99 (5):72-73. It’s absolutely chilling how the corporate/technocratic forces bearing down on all public sectors as well as public education can so cynically co-opt the authentic language of civil rights and such a welcome phrase as “community schools.” The most vulnerable are the most easily ensnared. Here is a poem I came up with a few days ago that seems to fit this impending disaster of children’s well-being and most personal data exploited by callous interests to enhance their wealth and influence. As always, the need is to ask: Cui bono? Wow, Sheila! Great poem. So many of these reforms seem to be one thing when they are really another. Project Unicorn sounds so lovely….right. Thank you. I know a lot of people on board for community schools. I’ve worried about this for a while. I know that it’s tied to tech and am still learning how that will work. This model is in contrast to real community efforts at education. I visited a school in Atlanta almost 40 years ago. Seeing a community in need, teachers and local professors had created a place for students to go and learn when they had time. It served a population that was non-traditional, and offered GED, regular diploma, and some disconnected coursework for interested parties. It was orderly and effective. All instruction was personalized, because no two students could get there at the same time. Most of the students were working to,support a family, often an extended family. Considering this model, I see nothing wrong with alternative approaches. The problem is that the reform movement seeks to make the big bucks by not hiring teachers. This approach might even be better than what we now try to for some communities. But it is far more labor intensive, needing more and better trained teachers, not fewer. There are many good uses for computers and on-line learning. But there are many on-line opportunities that are terrible. Only intensive interaction on site with a teacher can bring out the difference between a really good course and an abysmal one. There is, therefore, no money to be made offering good courses. To the contrary, you need to hire more teachers at higher wages who work weird hours. Reform advocates are not being honest when they deny these aspects of alternatives to traditional education. Our present system evolved in response to economic pressures to keep costs down. Thus cost are lower for a traditional school than for alternatives and communities get brick and mortar structures that can be used for a variety of community purposes. Alternatives cost more unless you balance the budget on the backs of the teachers and school workers. We can call anything a rose, even if it smells like a cow pie. Real community effort is expensive, and yields good results. Thanks, Roy. I agree. I think SIBs are the real threat here. Certainly, community schools that are for assisting students and also bringing students together are what’s called for.